Learn how to use Google Now to automatically give you updates and information you want on your Samsung Galaxy S 6. Discover how to use your voice in Google Now to write an email, create a calendar event, set an alarm and more on your Samsung Galaxy S 6. Discover how to search for and download an app or widget in Google Play™ Store on your Samsung Galaxy S 6. A visual walkthrough for uninstalling an app or widget from your Samsung Galaxy S 6. Learn how to find places around you in a chosen category using Google Maps on your Samsung Galaxy S 6. A visual guide on how to navigate to a location using Google Maps on your Samsung Galaxy S 6. A visual guide for how to add layers to Google Maps to view current traffic on your Samsung Galaxy S 6. Learn how to add trackers like step tracker on your Samsung Galaxy S 6. Discover how to customize your health profile with your Samsung Galaxy S 6. Discover how to measure your blood oxygen level on your Samsung Galaxy S 6. Find out how to set up your S Health profile on your Samsung Galaxy S 6. Learn how to track your heart rate using S Health on your Samsung Galaxy S 6. Learn how to change S Voice settings on your Samsung Galaxy S 6. See how to set a calendar alarm with your voice using S Voice on your Samsung Galaxy S 6. A visual guide for how to back up call history and messages with Verizon Cloud on your Samsung Galaxy S 6. Discover how to back up your contacts with Verizon Cloud on your Samsung Galaxy S 6. Learn how to back up photos, videos, music and documents with Verizon Cloud on your Samsung Galaxy S 6. 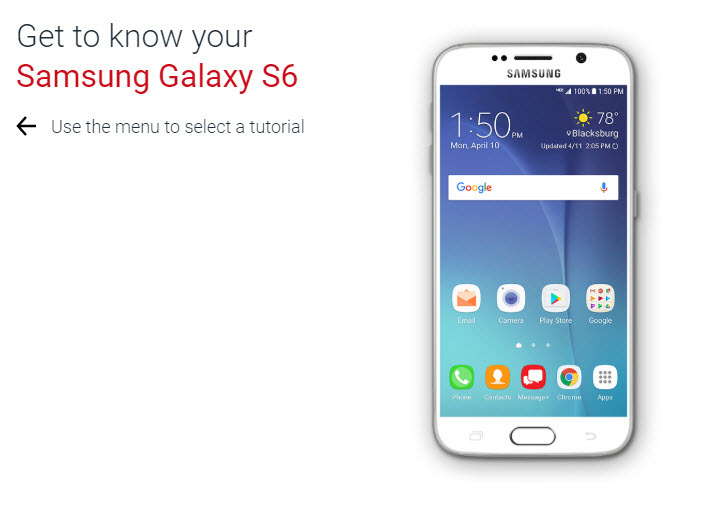 An interactive guide on how to download files from Verizon Cloud to your Samsung Galaxy S 6. Learn how to restore content to your Samsung Galaxy S 6 with Verizon Cloud. An interactive guide on how to set up Verizon Cloud to back up content on your Samsung Galaxy S 6. Discover how to attach a video to a text message using your Samsung Galaxy S 6. Learn how to reply to a text message on your Samsung Galaxy S 6. Discover how to send a text message using your Samsung Galaxy S 6. Learn how to search for a location by category using VZ Navigator on your Samsung Galaxy S 6. Discover how get directions to a location using VZ Navigator on your Samsung Galaxy S 6.